It’s no secret that the intent of using lightweight honeycomb reinforced stone panels is to have the building look like it is clad with thick substantial stone. Since our panels are flat and never more than 1” thick, we (and our competitors) rely on mitered / factory assembled corners to give the appearance of thick stone. If the quality of these corners and returns is poor, or even fair….then all is lost. In those cases, the entire project reflects bad workmanship. Here is where we stand out like no other company. The quality of our corners is so great that even from a few inches away , you cannot tell that this isn’t a very thick piece of stone. This all done at our factory, in a controlled & dust free environment. Our quality is always consistent from panel to panel. Many of our competitors send the corners unassembled (to keep their costs down) and this can end up fair, bad or terrible…. never great. Installers in the field will never be able to match our mitered / assembled corners. Neither will our competition for that matter. Our process is proprietary, tested and proven; and our quality of corners is what distinguishes a good project from a great project. Strength is a very important factor on the corners as well. Ours are designed that even in an extreme bending moment, the corners do not fail. In fact, our miters are so strong that with this extreme force, the flat body of the panel will break before the corner gives out, and this takes an incredible amount of force. 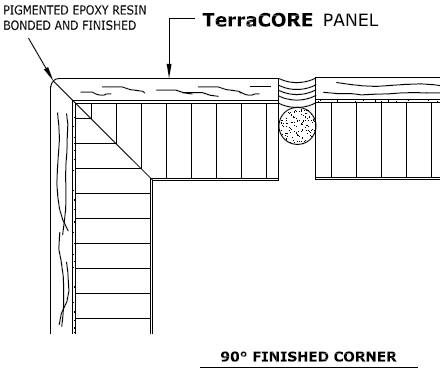 TerraCORE Panel corners have undergone a myriad of testing for all climates, environments, building sizes and conditions. Our process is proprietary, and works with any stone type, color and texture. I hope that all of the information above gives you and your team a greater sense of comfort that you are making the right choice. If you need any additional details, samples, or data, please DO NOT hesitate to ask. It is my goal to make this entire experience with TerraCORE as smooth and easy as possible.